According to ETUFOR, The Department of Transportation. There are 4392 registered taxis and 53 designated taxi stands in Fortaleza. Some taxi drivers belong to cooperative groups and are dispatched by radio. does not have the red plate! 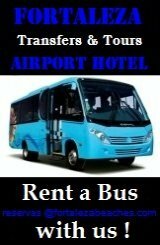 Fortaleza Airport-Hotel Private Taxi Service here! their name on it. Payable upon arrival in your destination. that would go beyond R$ 20:00 on the meter. Holidays and the entire month of December. If you don't speak Portuguese write your destination down on a piece of paper and show it to the driver. If you agreed upon a fixed rate. Write that down as well. Make sure you have a firm agreement with him before taking off! It's very easy to be misunderstood. Even Brazilians from the southern states have trouble understanding the people in Fortaleza and vice-versa! 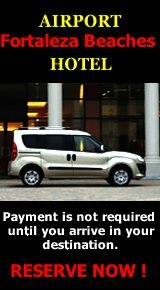 For Fortaleza Beaches and other destinations beyond the city limits you have to negotiate with the driver before taking off. The drivers have a list that includes most destinations and their distance in kilometers from Fortaleza. To calculate any fare. The local rate is R$ 2.00 per kilometer. So if your destination is 50 Km from Fortaleza. You have to include the drivers return trip whether he is coming back with you or not. As you get further from the city the rate per kilometer becomes less. Yet, the greater distances make the trip by taxi less practical. Canoa Quebarda a very popular destination is 167 Km from Fortaleza, 334 km (round trip). The trip takes 2 1/2 hours if you don't stop. 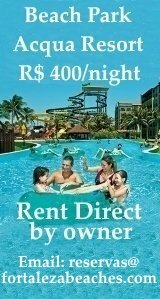 A good rate is R$ 300.00 one-way aprox. R$ 2.00 per/ km. per/km. A very long and tiring trip by taxi. For Jericoacoara I would recommend the Fortaleza Airport / Hotel Vans which depart from the airport or any hotel in Fortaleza daily. 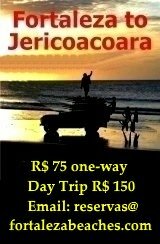 One way is only R$ 75.00 and includes the last leg of the trip by 4 wheel drive to Jericoacoara (less expensive than the bus and gets there faster. No payment is necessary to reserve but you do need to book your seats in advance. For more information or to make a reservation fill out the contact form. and beaches along the Coast of Ceara. A complete list of destinations and fares from Fortaleza International Airport. A list of destinations and distances for the state of Ceara in alphabetical order. Including Canoa Quebrada and Jericoacoara.